The first time I saw the Keizer 42 moored to the dock at Chesapeake Yacht Center, my first reaction was “She’s Big!” The 42 is a modern design that captures the spirit of the big 30- and 35-foot classic runabouts built in the heyday of the wooden motorboat era. This boat is not for everyone, but if you want a good looking day boat for enjoying time on the water, the 42 is for you. Even at rest, the Keizer 42’s high freeboard, graceful sheer, flared clipper bow, and clean, uncluttered decks give her a powerful and capable look. Her deck hardware is beefy and in the right places, including mid-ship cleats on both sides. Two folding fender eyes on each side are a nice touch. The self-stowing Delta anchor is attached to 165 feet of eight-millimeter galvanized chain controlled by an electric windlass. Because she is a runabout, there is no deck house, but a back swept windshield with graceful arched side windows complete her distinctive profile. After boarding over the swim platform, a gate in the starboard side of what is described as the largest open cockpit in her class gives access to an open-air space obviously designed for gracious living. The long cockpit floor is completely level with no breaks or steps. To port is a large upholstered sunpad, a portion of which swings up to expose a large storage area. The sunbathing area shares a backrest with the back of the aft cockpit settee. A long settee is on the port side of the cockpit behind the folding table. To starboard, behind the double wide captain’s chair at the helm station, is the cockpit galley with a two burner electric stove, a grill, a sink, a refrigerator, storage, and a built in wine cooler drawer. A retractable bimini and a cockpit cover for storage complete the package. The helm station is on the starboard side and is equipped with all the normal controls as well as a Garmin VHF, a Garmin GPSMAP 7412, and a bow thruster. 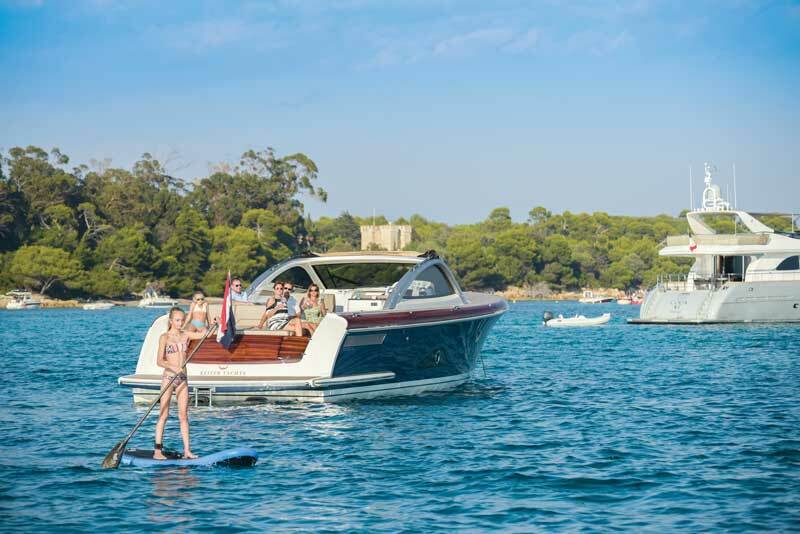 Our test boat was equipped for the European market with a thruster rather than a joystick. Apparently the Europeans are not as enamored of that device as we are. One very nice feature of the dash is the double row of all the important gauges along the top, all analog black-on-white faced with red pointers, easy to read in direct sunlight, even when wearing polarized sunglasses. Going below one finds a surprisingly spacious main cabin with six-foot-plus standing headroom. There is a queen size vee berth forward with a settee across the foot and a settee on the starboard side. The area is well lit with indirect lighting and three skylights. Aft, behind the steps, is a guest cabin with two berths. This area has sitting headroom and is surprisingly bright with lots of natural light from a classic porthole set in an arched window on each side. A galley to starboard and a head complete with glass-doored shower stall to port complete a surprisingly pleasant overnight space for four. The Keizer 42 boasts the largest open cockpit in her class. The large sundeck and settee area is hinged at the after end and raises up to provide great access to the engine room. The twin Volvo D6 400-hp supercharged common rail diesels are mounted right aft and deliver their power through DPG Duoprop counter-rotating stern drives. The engines provide easy access to all filters, dipsticks, and header tanks. The fuel filters are mounted on the single fuel tank which runs across the front of the engine room. Since this space is as wide as the beam of the boat, all the other noisemaking equipment, such as the Panda generator and air conditioner, are mounted here. Leaving the slip, the 42 handled easily with the bow thruster. As we idled across the harbor, engine noise was almost nonexistent. The boat has a deep vee hull with a 16.5 deadrise. As with most deep vees, she got up on plane quickly with no fuss and a minimum of trim tab. We tried it with no trim tab and the bow rose a few degrees, but the operator never lost forward vision. At wide open throttle with a full tank and five adults aboard we were showing a speed of 39.5 knots on the GPS. Even at that speed the noise level was remarkably low in both the cabin and the cockpit. In several high-speed turns there was no skidding or hobby horsing; she came around as if she were on rails. I only wish I’d had a seat belt! On the trip back we cruised at 20 knots into a small chop, and the ride was quiet and smooth. 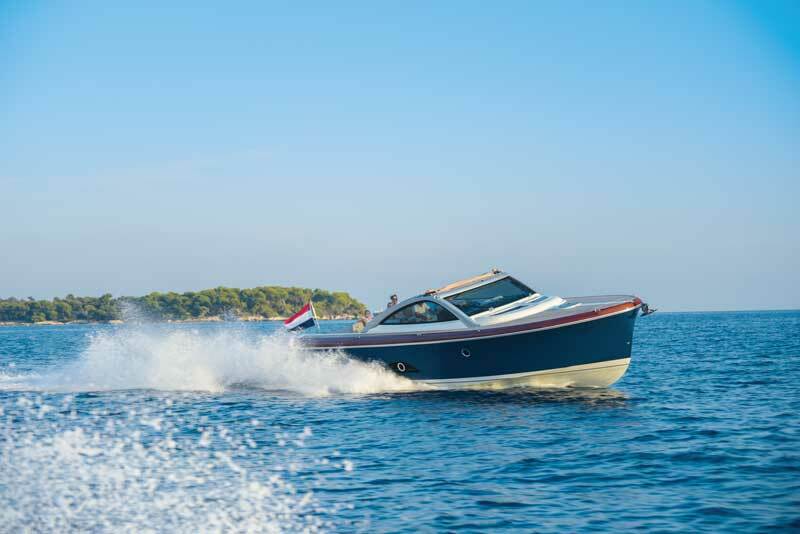 The Keizer 42 was designed by the Dutch naval architectural firm Vripack and built by Bavaria Yachts in its modern plant. The 42 is built to the tough CE-B standard, and it shows in all the fit and finish. This boat may not be for everyone, but if you want a comfortable day boat for knocking around the Bay, the Keizer 42 is hard to beat. Want to see this boat in person? Chesapeake Yacht Center will have the Keizer 42 on Dock C at the United States Powerboat Show in Annapolis, October 11-14.